PHOENIX – Arizona teachers, parents and legislators teamed up last year for the sake of children’s health, pushing for legislation that would require more recess or unstructured playtime for elementary school children. The early results of that effort are promising, educators say. In April, Gov. Doug Ducey signed SB 1083 requiring schools to provide two recess periods for children in kindergarten through third grade this school year. The law adds fourth- and fifth-graders next school year. Some schools hit the playground running and are already seeing a positive impact. 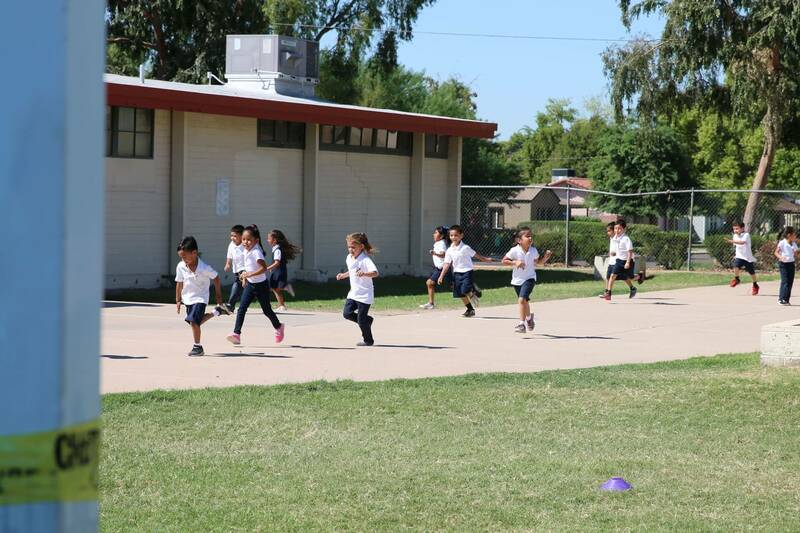 Since implementing the added recess time at Stanfield Elementary, a small pre-kindergarten-through-8th grade school in rural Pinal County near Casa Grande, principal Chris Lineberry has seen improvement in the overall health of his students, but in other ways, too. He said test scores are up, discipline problems have decreased and attendance has increased. “There’s information that does indicate that there is an improvement,” he said. “As a result, we have happier kids, happier staff and a more successful school. It is all part of an effort to encourage healthy habits and battle childhood obesity. In the most recent 2018 U.S. Report Card on Physical Activity for Children and Youth, Arizona children scored slightly higher than the national average in multiple categories but fell behind in others, including overall physical health. Those national averages, however, are not extremely high to begin with. The national grades in each category hovered around low C’s and D’s. Josh Meibos, a physical education teacher at Crockett Elementary School in east Phoenix and 2018 Arizona Teacher of the Year, takes his students’ health to heart. He was a key member of a group that approached the education committees of the Arizona Senate and House of Representatives in support of more recess time. “When we went to the Senate and House committees, we were advocating, explaining, and almost educating the committee of what type of continued learning happens on a playground,” Meibos said. Some critics of recess say it’s a forum for bullying. A study by Johns Hopkins University’s Bloomberg School of Public Health found that 6.2 percent of middle-school bullying took place during recess. And some of the pushback Meibos and the parents received focused on whether adding recess time would subtract from academic learning time. However, the group was able to make its case by stressing the “continued learning” aspect of recess. “It wasn’t too difficult of a decision to realize that the continued learning happens on the playground just as much as in the classroom,” Meibos said, who said students develop social skills at recess while also receiving the physical fitness benefits. It’s important to put children on an early track to a healthy lifestyle, Meibos said, and increased playtime is one way to do it. Lineberry also finds early development crucial. He wanted to get the school’s 550 children up and moving throughout the school day. Lineberry believes the best way to combat America’s obesity epidemic among adults is by teaching children healthier habits while they’re in school. Meibos and Lineberry have felt pushback in their pursuit of healthier students. There are those in education circles who worry that taking time away from academics can be detrimental to students, and schools are evaluated, in part, by standardized student testing. “I think that there are many districts and administrators and leaders that come from a place of being fearful,” Lineberry said. “They want to improve test scores and are afraid if they don’t, they’ll lose their jobs, or that their school will have a bad review in the newspaper (or) community members will think poorly. etc. Meibos, Lineberry and other educators are challenging the belief that test scores should be the highest priority. They believe the recess law is an important first step toward establishing that a child’s physical and mental health is as important as reading, writing and math. Their hope is that the lessons will carry over from school to the lives of their student at home.